Colleen, also known as “The Celtic Medium”, is an Internationally renowned Irish Psychic Medium, Tarot Expert, Para Investigator and TV Personality featured on "Paranormal Lockdown” with Nick Groff and Katrina Weidman on Destination America and recently on “Rogue Mysteries” with Bill Brock on Amazon. 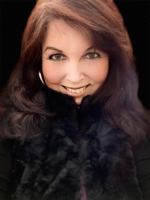 She has a new TV show called “The Celtic Medium Colleen Costello” that airs every Thursday night at 9 pm on “The Spirit Realm Network” where she connects you with your loved ones crossed over and gives readings. Using her expert lifetime experience in the Tarot, her ability to connect with those crossed over, Colleen uses a combination of traditional Tarot, Angel Oracle Cards, along with guidance from the Angels, Spirit Guides and Ascended Masters, overseen by her spirit guide Archangel Michael, to guide you in solving any present difficulties in your life, whether it be spiritual, relationship, financial, work, or dealing with the loss of a loved one in your life. She looks in depth at any blocks in your life and helps your find ways to overcome them so that you can live a full, abundant and spiritually happy life. As a natural born Medium she connects you with your dearly departed loved ones with love and comfort, delivering messages to provide validation that your loved ones are very much still with you in spirit guiding you and protecting you. As a pet lover, she knows how pets are a huge part of family so she also helps you connect with your dearly departed pets, so that you can feel comfort knowing that they are at peace. Colleen wants to help you find happiness, peace and solitude in your life. Her readings are in depth and positive and you will always leave feeling uplifted and spiritually more positive about your life. As a spiritual guide, life and business coach and teacher Colleen is able to help you find the direction you need and fulfill your hopes and dreams. Her warm fun personality makes you immediately feel comfortable In her presence. Her goal is to continue to spread joy and hope and provide spiritual healing to those who need it. Colleen is available for private confidential readings in person at her home office/over the phone/Skype/online and also instant readings/chat readings via Bob Olson’s Best Psychic Directory. She is available for home parties/events and supports fundraisers. Colleen is the real deal! She is consistently accurate and insightful. She has given me clarity on issues that have been a huge burden. Every time I speak with Colleen, I feel a sense of peace and calm. I would highly recommend Colleen. Simply put she is amazing! Colleen is wonderfully accurate, sweet, honest and brilliantly talented- I was overcome with emotion after speaking with her and truly amazed at her knowledge. She gave much more than I could have ever hoped for with a joyful message of peace that I'll carry with me always- words cannot describe how I feel at this moment! I am no longer ever going to doubt that angels are among us- Colleen brings one here on earth. I highly recommend her, and I will be calling on her again! I met Colleen at a psychic fair about two months ago. Both times I have seen her I have been able to contact my loved one. The messages she gives are accurate and clear. I have had such excellent medium sessions with her that I plan to book a party this winter. I would HIGHLY recommend if you are looking for a medium/psychic that you use Colleen. You definitely will not be disappointed. She is amazing! I would highly recommend Colleen to anyone wishing a clear, loving, honest, insightful and highly meaningful reading. She was spot on with my reading without knowing details. Even when she described a key individual matching my description! Colleen's prices are very reasonable and the way in which she explains the cards and how she is getting her information allows the person being read to understand the whole process. She's the real deal! I had an amazing reading experience with Colleen, the message she passed to me from my girlfriends father was very special and amazing. Colleen knew things noone else would know and even if I was a little skeptical going in I left a believer! I met Colleen when. We were 'neighbors' at a psychic/vendor fair. It wasn't overly busy so we got to chatting and eventually she purchased some of my products and I booked a short reading with her. What Colleen shared with me was amazing and exactly what I needed to hear-and I didn't even realize it until we spoke. My mother, who had recently passed came through and the message lifted such a weight from me. I didn't even know I was byKmcarrying such a burden! I can't wait for another reading!